Minnesota brought in freshman quarterback Demry Croft in the fourth quarter. Minnesota knew it had a tough challenge playing at No. 16 Northwestern, but the Gophers ended up laying an egg — and also put up an egg on the scoreboard. The Gophers couldn’t get much going on offense either in the run or pass game and never even made it into the red zone. 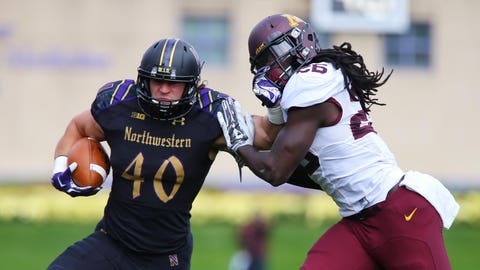 Northwestern didn’t have a great offensive game, but with a strong defense and some big plays trounced Minnesota 27-0. — Minnesota played without injured cornerback Briean Boddy-Calhoun and safety Damarius Travis. During the game, offensive lineman Joe Bjorklund had to leave. — It took until the fourth quarter of the fifth game, but Minnesota finally brought in freshman quarterback Demry Croft. Leidner struggled, especially on longer throws where his passes often sailed high, and with the game out of hand Croft got his chance. Of course, bringing in a freshman for the first time against a defense like Northwestern’s in a blowout might not have been the best way to debut. Croft did OK, showing some inexperience in taking a sack and nearly throwing a couple of picks. But he also had good zip on the ball and did throw it away once when nothing was available. Minnesota head coach Jerry Kill wouldn’t commit to a QB, but why burn a kid’s redshirt season if he’s not going to play? — Meanwhile, in the fifth game, Shannon Brooks became the third different running back to start. Rodrick Williams started Game 1 then gave way to Rodney Smith, who actually had one more carry than Brooks against Northwestern. — The Gophers struggled to complete anything downfield and their longest play — a 23-yard pass — came about when another Minnesota receiver picked the Wildcats defense by accidentally running into a defensive back. Minnesota ran a lot of screens and bubble passes. — Minnesota didn’t show much confidence in the pass game. With under two minutes in the half, the Gophers passed on first down (for 6 yards) then ran the ball on the next two, gaining no yards either time. Northwestern, using its timeouts, was able to get the ball back with 1:06 remaining. 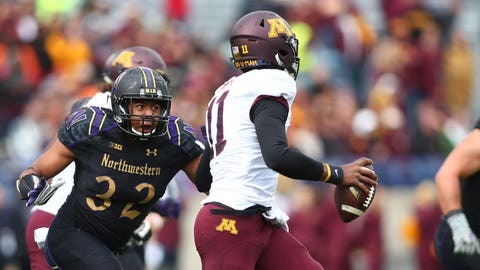 — Minnesota did create one fumble as Northwestern’s Justin Jackson coughed it up on a run, but the Wildcats pounced on the ball. — Peter Mortell had a couple of line-drive punts, the second of which was returned 55 yards to the 5-yard line with Mortell making a nice touchdown-saving tackle (of course, Northwestern scored on the next play). — Minnesota converted just 4 of 16 third downs. Northwestern converted 7 of 17, including three on a long third-quarter drive which netted a 23-yard field goal. The Wildcats also converted a fourth down on that drive. The Gophers were 0 of 4 on fourth-down attempts. — Northwestern appeared to have an interception in the fourth quarter — TV replays showed it was a pick and shouldn’t have been ruled incomplete — but one play later Leidner fumbled and the Wildcats returned it for a touchdown. It’s only the first game of the Big Ten season so it isn’t the end of the world, although certainly a win is nicer than a loss. Getting healthy would be a boost to the Gophers, but so would figuring out this offense. Easier said than done. There are real issues here. Take your pick with any one of a few defensive players. We’ll go with Jack Lynn, who had eight tackles, two tackles for loss and a big hit on Northwestern QB Clayton Thorson. Again, look to the defense and throw a dart. Eric Murray had seven tackles — six solo — and forced a fumble, which could have been a game-changing way had Minnesota, you know, recovered. In the third quarter, Minnesota was down 13-0 but driving in Northwestern territory with a chance to make it a one-score game. The Gophers had a 3rd-and-6 on the 34 and decided to run the ball, gaining three yards. On fourth down, it looked like Matt Leidner’s first choice on a pass might have been a little flare but that was covered. Instead he threw downfield too high, incomplete and loss of downs. Northwestern then went right down the field for a touchdown to really put the game out of reach. 2.75. Minnesota’s average yards per play, its worst output since Nov. 24, 2012 when the Gophers averaged 1.96 yards per play in a 26-10 home loss to Michigan State. It would seem as though Minnesota (3-2, 1-0 Big Ten) has a good chance to get back in the win column next week as it travels to Purdue (1-4, 0-1). The Boilermakers’ only win is against an FCS team and they’ve lost 10 in a row against FBS teams. However. Purdue did give Michigan State a game Saturday after getting down big early. 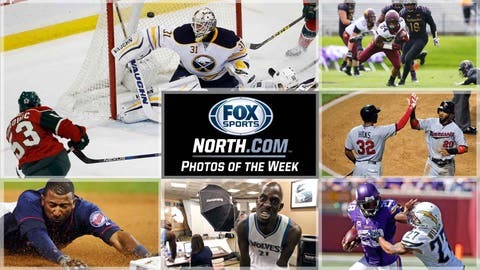 See the best shots of the past week in Minnesota sports.